This is a visualization of cantilever sensory array technology. Bacteria are shown in red and white, and antibiotics are shown in blue. The laser deflection illustrates how cantilever bending is measured. The London Center for Nanotechnology has developed a tool to measure antibiotic drug resistance using nanotechnology and lasers. The Cantilever Sensory Array uses lasers to measure the cellular stress levels of a bacteria's cell wall when antibiotics are exposed to it. This will provide researchers insight on how effective the antibiotic works on the bacteria in real time. Antibiotic resistance is a type of drug resistance where bacteria (or some other micro-organism) are able to survive and counteract the effect of an antibiotic. This tool can help in dealing with microorganisms that have a high resistance for antibiotics such as methicillin-resistant Staphylococcus aureus (MRSA) which is known for being resistant to antibiotics. Staphylococcus aureus is a common cause of skin infections, respiratory disease, and food poisoning. S. aureus is a surface bacteria and can survive for months depending on the strain. By using the Cantilever Sensory Array, hospitals can track in real time how drug candidates interact with a target microorganism. This will help in diagnosing and treating infections and diseases faster and more effectively. On October 25, JoVE, the Journal of Visualized Experiments will publish a novel technique to confront the problem of antibiotic resistance. According to Dr. Joseph Ndieyira, one of the developers involved in the technique, "The use of this technology will allow scientists to understand how antibiotics work, how bacteria develop resistance, and what molecular mechanisms could be exploited to get around their defense mechanisms." "We report a novel, nanomechanical approach to investigate the workings of vancomycin ... one of the last powerful antibiotics used to combat increasingly-resistant infections such as methicillin-resistant Staphylococcus aureus (MRSA)," said Ndieyira. Using tiny cantilevers (or beams) no wider then a human hair, Ndieyira and his colleagues take advantage of the cellular stress that antibiotics, when effective, impose on a target bacteria's cell wall. Such stress in turn causes the cantilevers to bend. 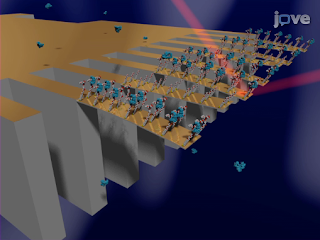 Using lasers, the bending can then be measured—providing tremendous insight into the drug-target interaction. "The cantilever assays provide a resolution that simply cannot be obtained with conventional methods, such as those using fluorescence," said Ndieyira, "For example, cantilever sensors can resolve forces of ~10 pN, which is sensitive enough to detect the rupturing of individual hydrogen bonds." According to the article, a single hydrogen molecule can be the difference between drug-susceptible and drug-resistant bacteria. The cantilever technique is currently under review in the science journal Nature for its clinical use in a microchip. "This prototype will provide a platform for more sensitive measurements, enabling results in early detection of infectious diseases, rapid identification of a host of new biomarkers, and for the engineering of portable diagnostic tools," said Ndieyira. He also described the technique as a possible alternative for drug experimentation on animals. When asked why he and his colleagues decided to publish their technique through video, Ndieyira said, "JoVE is the only journal that provides a unique and powerful opportunity to communicate my latest measurements and procedures visually, thus making it easy and effective for others to replicate the experiment.